Winter can be a particularly hard time to keep chickens. During the cold months, I used this time to purchase the chickens that people−the folks I referred to as Towneyz −didn’t want anymore. I LOVE chickens. I always call them my girls. They bring me so much joy and I –of course−love their eggs. They are a very easy pets, but do require some care. They are especially fragile in the winter and convenience is your friend. There are tried and true methods to keeping your girls cozy and loved in the winter. This one needs to be repeated. I will be talking about this again. Chickens, like all species, need water. When the temperature gets below freezing, they still need fresh water. This is the most important part of winterizing your chickens. One year it got extremely cold and reached temperatures way below freezing. I bundled myself up and thought of the how the cold can negatively impact my chickens. Needless to say, I did keep them locked away. I made sure they had fresh water by buying a small heat source at a local feed store and the accompanying waterier. Making sure your chickens have unfrozen water may be one of the most important things you can do for them. Yes, some warmth and shelter are important. The most valuable thing is water though. If you don’t have means to plug in a device to provide electric heat, consider carrying boiling water to them. No, you don’t want to leave them with scalding water. Yes, you do want water to be warm enough to melt all the ice and provide them with fresh water everyday. Before I had a heat element, I used this method and it did melt the frozen water and cooled when it melted the ice. Make sure the water is cool enough to drink, but not so hot it causes burns. Think of their water temperature like you would warming up a bottle for a human baby. Test the water temperature on your wrist before you leave the coop. If it’s too warm for you it is too warm for your girls. Making sure they have an adequate supply of fresh water daily is imperative. If they go too long without fresh water then they will die. 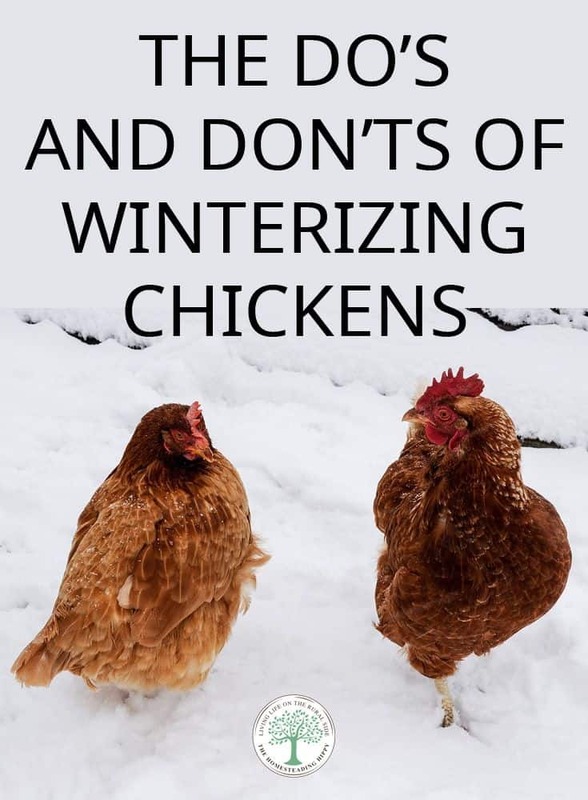 This is probably the most important thing you can do to winterize your chickens. They should have clean and fresh water every day of the year. In the winter make sure it doesn’t stay frozen. Even in the cold winter months your chickens need exercise and to be outside. I always did everything I could to let my chickens out every day. They need to be able to get sunlight for some time during the day. I raise several varieties of chickens, and they will still occasionally lay eggs in the winter. You should always let them out to walk around and you should still check for eggs. Know that chickens lay according to the path of the sun. They usually stop laying around the fall equinox and don’t start again until the spring equinox. If you don’t want to head out to your coop everyday, there are door opening options you can plug into your smart phone. Installing a door that you can open from your phone is an amazing addition, and can keep you warm on those chilling days your girls need to get out, but you want to stay in. Pick a day in the spring to install it. You will need to still be able to cut a hole in the wall of your coop. Chickens will be able to figure out the location of the opening. If your coop is high up, a simple staircase can aid them in getting down. They do have the ability to fly short distances, and if you don’t want to install a staircase you don’t have to. We’ve embedded a video that shows you just what kind of door you can put in and operate from your smart phone. You want some form of chicken house for your girls. In the summertime, if you leave your windows open and screw in a type of chicken wire that will suffice. In the winter you still want a form of ventilation for your birds. To make a simple window cover all you need is a straight edge and a drill. With galvanized staples, you can get some simple plywood and cut it the size of your window. It’s then you go to the hardware store and purchase some hinges and follow the directions to put on the door. This provides a way to ventilate your birds and keep them closed in in the winter. This quick and easy window on your chicken house will help keep it insulated during the cold nights and provide a simple and cheap way to protect your chickens in the cold winter. Winters are hard for chickens. Living a simple lifestyle that isn’t pressed on things like time really is easy. Hens are more care in the winter, but everything is. It really is a fun time to see your first egg. The best way to keep them cozy in the winter is to build them a simple door covering for your chicken window. Drafts and breeze are a nightmare, however, they do need ventilation. They need some fresh air in the winter. With a little planning you can make a simple window. Chicken care in the winter can be more difficult. They do need ventilation, but a cold wet breeze can spread disease. Keep the water clean and fresh and keep the windows open in the winter. By installing this easy door for your birds, you will be making it less of a chore and more of a joy. This isn’t a good time of the year to clean your coop. Do it in the spring and put the shavings in your compost bin. This season is about keeping them comfortable until spring. Now, there is controversy over owning a heating lamp. It is a potential fire hazard. For more information on coping with fire, we do provide information on what do to if there’s a homestead fire. There are chicken folks who say you don’t need a heat lamp. This is akin to what is termed Forced Laying by adding light. It isn’t necessary, but you might want to consider it. If you don’t have access to electricity going into your coop don’t go insane trying to get it there so you can add a heat lamp. One year I lowered my heat lamp too low and one of my birds got burned. It was not fun to deal with. However, a properly installed lamp that is raised can provide some additional heat. Chickens grow and under feather or down undercoat in the winter. They do have natural abilities to keep warm during the cold months. I installed a heat lamp because I had electricity leading up to my first coop. Straw is a great insulator and can serve your chickens in the winter. By adding a heat lamp, you are adding a potential fire hazard. I have had weather where it got below 25 degrees. To me, that was too cold for my girls. I know you don’t want to cause too many problems for your girls. You want them comfortable and happy. However, installing a heat lamp can add problems and not eliminate a problem. Heat lamps are a big consideration and not something that you need to stress about. You will become a Chicken Master in time. 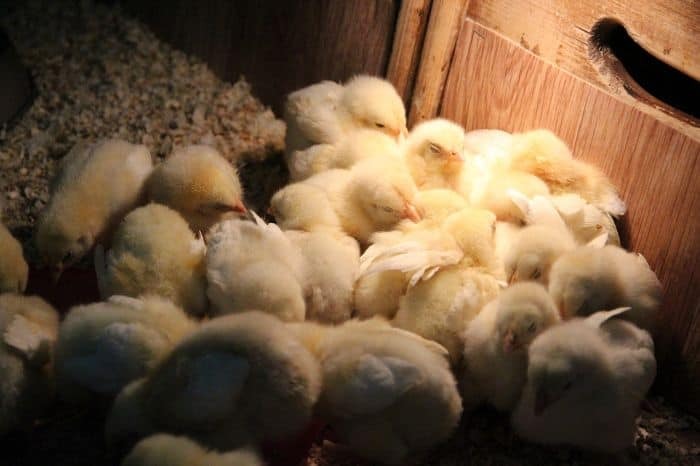 You do not need to start your flock with a heat lamp unless you are starting with baby chicks. Predators can cause a lot of problems. If you are thinking of installing a heat lamp and you have electricity going to your coop, know the dangers and be prepared. A heat lamp will add radiated heat. Hens can provide eggs all year around. In order to do this you will need to install lights that turn off at a certain time and come on at a certain time. That’s called Forced Laying. Hens lay in accordance with the amount of light in the season. Most hens do not lay during the winter. Know that if your hens do lay all year round, they will stop laying sooner. Know that hens do have a lot of predators, and if you let them lay in accordance to the season you may lose a bird anyway. I always kept one rooster in order to protect the hens. Once a predator knows there’s a food source they will return. There are some who simply say that it is an unhealthy habit to start. I say if you want to do it, do it. Know that it is an additional fire hazard. We’ve written about potential fire hazards in the past. All animals need dark and light. Adding additional lighting can cause health problems and make them age faster. Know this before you do it. If you want eggs all year round it is a consideration. Hens lay their eggs in accordance to the fall and spring equinox. If you do this, then try to not go above the lowest time right before fall. That way, you won’t be giving them too much additional light so they can still naturalize themselves for winter. It will be cold and you do want nature to in some way protect them. Very inexpensive and will make your coop warmer. Use it as a panel and a hammer to place and remember to remove it in the spring. If your windows aren’t covered, remember to leave some of the window open to provide air filtration for your birds. You don’t want soggy girls gathering in your coop. That is a hotbed for disease and your girls need some ventilation. It really is a great and inexpensive insulator. Feed really does cost quite the penny and winterizing your chickens can be a real pain. If you’re not planning on doing any Forced Laying or installing heat lamps then consider installing this. All you really need is time and a staple gun. Putting this extra insulation in your coop will help keep your girls sheltered and wick away dampness caused from the extra moisture caused by drafts and cold. If it gets damaged, then just take it off and throw it away. Nowadays, people order so much online, they have extra cardboard boxes just lying around. This is a very cheap way to keep your chickens warm in the winter. Remember that they do grow under feathers in the cold. They may not need heat lamps or extra lighting, but they do need shelter. Protect your chickens with this cheap insulation. In the dark winter months, your chickens will need some sort of shelter. 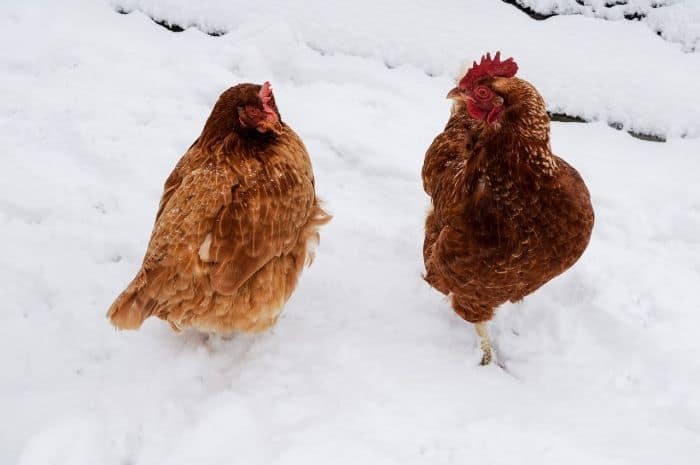 The two main killers of chicken in the winter are lack of water and frostbite caused from no shelter. The best way to prevent this is the provide some sort of shelter for them. If you’re skeptical of what would make good shelter, I suggest you find a tour in your community. This will give you a real glimpse into what people do for their birds and help you come up with an idea that will work best for you. There is a number of things you can use to adapt to a coop for your birds. If this doesn’t appeal to you, most farm places do sell ready-made pieces or coops at quite a higher cost. If you are planning to adapt or build your own coop, consider the roof. In many places in the winter, the roofs are specifically designed to withstand the buildup of snow. You will need to consider this when you build the roof of your chicken house. If too much weight is piled on, your roof may cave in and cause disarray and even death for your chickens. Make sure they do have some place to go in that provides them with shelter during the cold and wet winter months. Your chickens will need to go outside at some point during the cold winter. By scattering hay on the ground they will have bedding material on the ground that will help them stay warm. You always want the driest and freshest hay up top. Plan on scattering hay around your coop at least once per month in order to provide them with a place to walk around and get sunlight and exercise. One year I had the heat lamp in my nesting -boxes. One of my birds got too close and burned her back. Keep your heat lamp high enough to provide some warmth, but not so close that your birds get burned. Having your heat lamp too close to the ground or the hay or pine shavings can increase your chances of a fire occurring. A heat lamp is your choice and know there are risks. Chickens can withstand cold weather. They need fresh water and shelter more. Your chickens will need to go out every once in a while. Your coop will need ventilation or else it will get damp and sticky. This can cause rampant disease to spread. You will be doing your girls a disservice by heating the coop too much. You can prevent them from growing their under feathers. They need shelter and fresh water the most. There is an amount of sweat that goes into the caring for your chickens. They are more difficult to take care of in the winter. If you are really in to learning more about chickens, then find your local farm bureau or 4-H and don’t be afraid to ask questions. Another good place is at the local fair. People love to talk about their chickens and you can find a kindred spirit in the process. Adding heat to a coop will cause the ammonia in their poop to evaporate increasing the smell and the chances of lung irritation and thereby other illnesses. If you absolutely have to, or you can’t sleep a wink, consider putting your heat lamp on a timer so it is only on for a couple of hours during the coldest part of the night (which is usually right before dawn, ironically) If your birds get used to the supplemental heat and you have a power failure and can’t provide it, they might die of the cold because they haven’t grown enough feathers to withstand the weather.